Did you know that buckwheat is grown in New Brunswick? We get so accustomed to our food being from faraway places that it’s easy to forget so much food can be, and is, grown locally. The BBC food website has a list of 25 foods you should try at least once. They range from octopus to okra, but in the middle of the list is buckwheat. 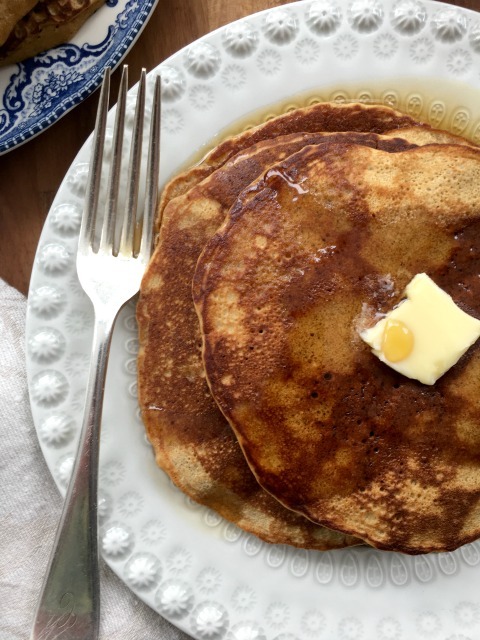 I don’t think of buckwheat as being exotic – it’s grown in New Brunswick after all - but reading it on the list did remind me of a great recipe for buckwheat pancakes that I have had for years. The great thing about pancakes is that you can enjoy them as a sweet or savoury meal, or both. When I moved to France in my early 20s the couple I lived with often made crepes for supper. Marie-France, my landlady, would make a huge stack and we’d begin the meal eating them with cheese and Dijon mustard. Halfway through the stack the plate of cheese would be replaced by jars of jam and honey, and onto dessert we’d move. 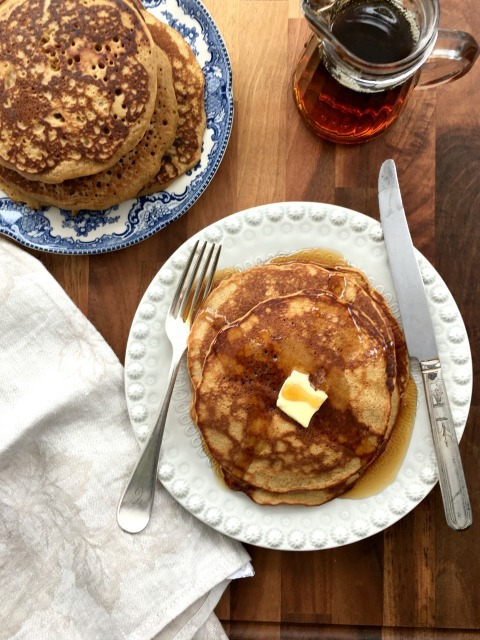 This buckwheat pancake recipe is from DeborahMadison’s terrific cookbook, Vegetarian Cooking for Everyone. 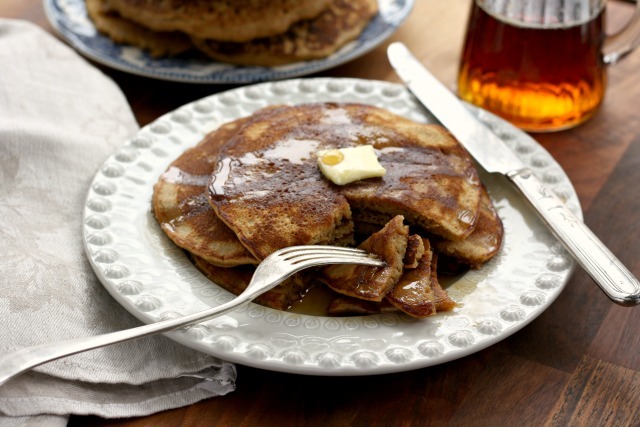 She serves her buckwheat pancakes with molasses butter, a combination of melted butter and molasses. 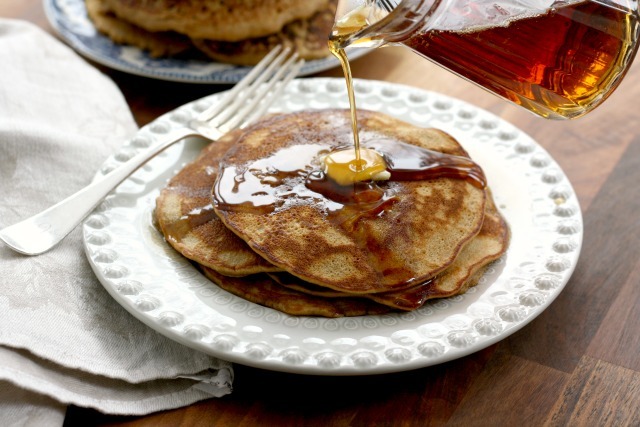 We top buckwheat pancakes with a generous pour of real maple syrup. Leftovers can be frozen and reheated in the toaster. And they make a great lunchbox snack. If you love buckwheat and would like to find more ways to bake with it try my Buckwheat Pound Cake recipe. In a large bowl whisk together dry ingredients. In another bowl whisk the molasses, eggs, oil, and buttermilk. Add buttermilk mixture to the dry ingredients and combine well. Let the batter rest for 5-10 minutes. Warm a fry pan over medium and brush lightly with oil or butter. Using a ¼ cup measuring cup, pour batter into the hot pan. Cook until the top of the pancakes are covered with bubbles and the bottom are nicely browned. Flip and cook until done.